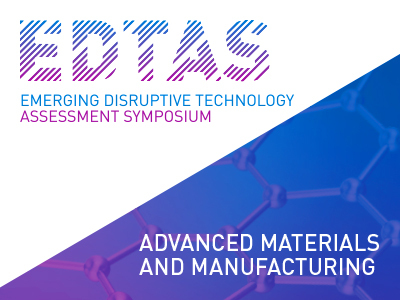 DST hosted an Emerging and Disruptive Technology Assessment Symposium (EDTAS) on Advanced Materials and Manufacturing on the 28-29 November at Cargo Hall in Melbourne. The EDTAS series helps future-proof Australian Defence by utilising the Next Generation Technologies Fund to consider an expansive science and technology topic that heavily impacts Defence and National Security domains over a 20+ year timeframe. The objective of this symposium was to shape future Defence research and preparations for emerging and disruptive trends in Advanced Materials and Manufacturing (AM&M). This event considered AM&M technologies in 2040, application in 2040 scenarios, capability concepts, and; drivers, barriers and implications for AM&M adoption. A key outcome from the symposium was a Big Picture Assessment Report developed through the workshop contributions of all attendees. This symposium provided participants with opportunities to network and partner, gain an understanding of particular strategic and S&T challenges, and provide input to shape long-term Defence and National Security guidance.